In this stunning new work that is at once a coffee-table book to browse and a complete cookbook, Janna Gur beings us the sumptuous color, variety, and history of todayâ€™s Israeli cuisine, beautifully illustrated by Eilon Paz, a photographer who is intimate with the local scene. In Gurâ€™s captivating introduction, she describes Israeli food as a product of diverse cultures: the Jews of the Diaspora, settling in a homeland that was new to them, brought their far-flung cuisines to the table even as they looked to their Arab neighbors for additional ingredients and ideas. The delicious, easy-to-follow recipes represent all of these influences, and include some creative interpretations of classics by celebrated Israeli chefs: Beetroot and Pomegranate Salad, Fish Falafel in Spicy Harissa Mayonnaise, Homemade Shawarma, Chreimeâ€“North African Hot Fish Stew, Roasted Chicken Drumsticks in Carob Syrup. With favorite recipes for the Sabbath (Sweet Challah Traditional Chopped Liver, Chocolate and Halva Coffeecake) and for holidays (Balkan Potato and Leek Pancakes, Flourless Chocolate and Pistachio Cake), this book offers a unique culinary experience for every occasion. All of this is enriched by Pazâ€™s gorgeous and vibrantly colored photographs and by short narratives about significant aspects of Israelâ€™s diverse cuisine, such as the generous and unique Israeli breakfast (which grew out of the needs of Kibbutz life), locally produced cheeses that now rival those of Europe, and a dramatic renaissance of wine culture in this ancient land. 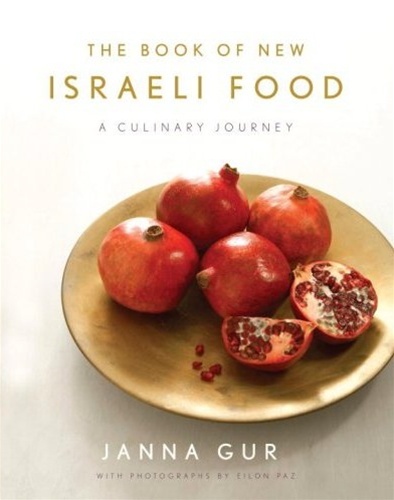 â€œIn less than thirty years,â€� Janna Gur writes, â€œIsraeli society has graduatedâ€¦ to a true gastronomic haven.â€� Here she gives us a book that does full, delectable justice to the significance of Israeli food todayâ€“Mediterranean at its heart, richly spiced, and imbued with cross-cultural flavors.